‘Look at that little 'un there between the piccolo and the clarinet! He'll be getting trampled underfoot in two shakes,' shouted a burly member of the 'Skeleton Army' armed for combat against Salvationists marching with the Regent Hall Band along Oxford Street. He pointed admiringly to a small, thin boy with head held high as he marched and played his cornet. 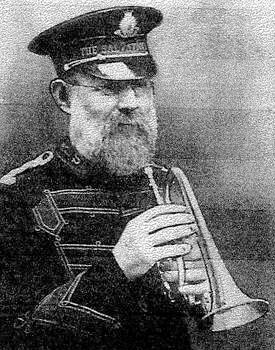 Often in order to keep pace with the tall bandsmen, Bert Twitchin had to take a hop, skip and jump; but the joy of playing his cornet more than made up for such slight inconvenience. Amid the shouts and laughter of the 'skeletons', the band marched along, taking for granted the eight year old Bert who had gate crashed into their midst because in 1883 there were no young people's bands formed to engage the talent of converted lads. The men received their full share of the persecution meted out to Salvationists in those early days, but young Bert's presence among them often evoked such admiration that missiles were carefully aimed with a view to avoiding the plucky boy. Such chivalry, however, did not suit the young bandsman, who wanted to carry upon his person some evidence of warfare. He would, therefore, watch for a volley of ammunition, then jump alongside the intended victim. When some of the refuse spattered on to his clothes, his boyish delight was unbounded. With parental pride mingled with a good deal of alarm, his father and mother would watch their 'battle-scarred' son march into the hall with the other warriors. Those were the days when only the valiant of heart could sing the song of victory. In March, 1882, Bert Twitchin was taken by his mother and father to The Salvation Army to see the opening of the Regent Hall. The adventure of witnessing Salvationists withstanding the ridicule and physical violence of their many opponents, awakened within the lad's heart a longing to share in their battles which was satisfied in Salvation Army service lasting seventy years. Young Twitchin had heard many others say those words, but now it was his own confession and committal. Small though he was, he could find no room at the crowded Penitent-form. However, with determined steps he made his way to the platform. There, alone and uncounseled, he prayed a simple, natural prayer, and his heart was at peace. In those pioneering days every convert was immediately set to work. Bert Twitchin had his eye on the band. At home he had practised and mastered the tin whistle, but the sight of a short, bewhiskered young man in a strange uniform on the Regent Hall platform gave him other ideas. Trumpeter Sheard accompanied William Booth on many of his campaigns, leading the congregational singing with his cornet. The cornet captured the imagination of the boy he would learn to play one of 'those things'. A cornet player's zeal for souls gave Bert his first opportunity to have a blow. During an intensive prayer meeting the bandsman slipped out of the band to speak to a man who seemed to be under conviction of sin. Twitchin took charge of his cornet and, during the singing of a chorus, put it to his lips and blew. To his astonishment and delight he produced a note that harmonized with the chorus. He tried again, this time pressing down the first valve. Out came another note, perfectly attuned to the singing. 'I can play this thing all right,' he said to himself, and made a third attempt, but this time the result was discord, jarring, but not dismaying - at least, to Bert. By now the cornet player was back on the platform and had resumed his place in the band. Too nervous to ask for help, the lad watched every cornet player in action and, seeing meetings were held nearly every night, there was ample opportunity for his observant eyes. In due time the lad procured a scale sheet and learnt to finger the scales. Each time a cornet player went 'fishing' in a prayer meeting, Bert would fill the vacancy he made in the comet section. The first brass band contest ever to be held in London took place in the Agricultural Hall, Islington. Sir Arthur Sullivan conducted the massed bands. By some means Bert Twitchin got into the building and listened, every nerve tense, to the expert cornet playing of the contestants. Thrilled, yet somewhat discouraged, he felt he would never attain to the efficiency of those experts of the brass hand world. Working hours were so long that there was very little time for personal practice. His financial affairs, too, were such that private tuition was out of the question. However, Bert was sure that the best way for him to serve God was through Salvation Army banding. He therefore fought away his discouragement and renewed his determination to learn all he could by any means available. Eventually, for twopence, he purchased from a bookstall in Farringdon Road, Henry C. Bannister's treatise on harmony and counterpoint, and thus began the self-imposed task of mastering the laws of music. At the end of a long day's work he would practice until weariness blurred his sight and numbed his fingers. A gifted and godly band sergeant, seeing the boy's keenness and industry, tutored and befriended him, rejoicing to see how quickly the lad mastered the rudiments of music, easily playing in any key. At the age of nine Bert took his regular place in the solo section of the band. Perseverance and patience brought further success, and it was not long before his cornet playing became known far and wide. In the Regent Hall Jubilee Year of 1932, Bert Twitchin had the honour of taking the band to play to the royal family at Buckingham Palace, afterward being graciously received by Their Majesties, King George V and Queen Mary. Whether playing to royalty in their palaces, to the sick in hospital, or to the poor in their poverty-stricken mean streets, Bert Twitchin always gave of his best. Each occasion was a highly esteemed privilege, a service to God and men to be rendered to the best of his ability. By the end of 1883 three other boys, not lacking in the valour and skill displayed by their leaders, had secured a place in the band. When not at school, young Bert was at the Army. The long week-end's activities were followed by a full programme for the week-nights. Despite the desperate attacks of the 'Skeleton Army', outdoor meetings were maintained. Indeed the intensification of the opposition stimulated the zeal of the Salvationists. Through it all little Bert played his cornet and kept in step with the march. Near to the Rink (the Regent Hall had once been used for skating), were the villages of Edgware, Burnt Oak, Elstree and Stanmore, regarded by the 'Rinkers' as good ground for evangelistic efforts. Edgware became an outpost, with numbers of Rink bandsmen taking responsibility for the activities. These men would travel to the villages on Saturday night, hold meetings all day on Sunday and - as Sunday travelling was strictly forbidden - would walk home a distance of some ten miles. Bert, too young for this ordeal, would either ride home on Saturday night or early on Monday morning. Two of the band's engagements necessitated long marches. One from the Regent Hall to the Grecian Theatre, City Road, the other to Hammersmith. Transport in the form of a pony was provided for young Bert, announced as 'The little mounted cornet player'. Keeping the saddle and playing, he rode in the line of the cornet section. At times the mischievous boy in him overrode the more sedate bandsman. On one occasion four boys, including himself, were billeted together. One possessed a tin whistle which was brought into service during the night. There were also frequent excursions to the bathroom (a luxury in those far-off days) for the sheer joy of splashing water. Both of these escapades brought a rebuke from the Bandmaster, which they received meekly; but their zeal for duty was unabated, for it is recorded that Bert and another boy put in a lot of semi-quaver work that was not in the written music. The same boys were on duty with the band when William Booth was conducting a great meeting at the Great Western Hall. The Founder suddenly stopped in his address, swung round and administered a sharp rebuke to 'one of those boys talking'. Bert never forgot the rebuke or his own sense of shame. About this time, featured on many of the band's programmes, was an item entitled 'Musical thoughts expressed as they arise on cornet and harmonium'. More than one audience gazed with surprise as the diminutive Bert moved toward the harmonium. With his cornet in his right hand and playing the harmonium with his left hand, he would proceed to coax from the two Instruments music that charmed and blessed. This was no mere exhibition of skill, but the expression, in musical terms, of a soul at peace with God. For many years this feature remained one of the musts on most Regent Hall Band programmes. November 15, 1886, marked an important milestone in the life of Herbert Twitchin. On that day, at the age of twelve, he commenced work at a firm of wholesale provision merchants in Smithfield Market. For a boy, nurtured from his earliest years in the wholesome atmosphere created by good parents and enriched by religious activities, entering the commercial and competitive atmosphere of a trading concern was hard. In the best of business establishments evil has its agents, and every newcomer is hailed as a possible recruit. Evil-minded men covet the potentialities of a growing boy. This new experience challenged Twitchin. By fear and faith he fought subtle temptations and held on to his ideals, praying hard at every opportunity. An awareness that, if he failed in these, his first real personal battles against evil, he was likely to fail everywhere, kept alive his fighting spirit. The Bandmaster, watching over him with fatherly concern, gave him encouragement and advice. His mother mingled prayers with words of warning. His father's faith increased his own. Bert experienced the joy of victory. Combining character with ability, the errand boy progressed step by step until one day he was appointed to the high office of managing director. If anyone doubts the possibility of business being carried on in harmony with Christian principles, let him consult the business associates of Herbert Twitchin. Early in 1910, after twenty-seven years in the band, most of the time as Deputy Bandmaster, Bert was called upon to take a commission as Bandmaster. He asked for time to give the proposal prayerful consideration. His long years of service with Bandmaster Blowers, had taught him that this position is not only one of privilege but of responsibility for the spiritual welfare of others. To second the efforts of Bandmaster Blowers was easy compared with shouldering full responsibility. However, with his own high ideals of efficiency and service, and with a firm resolution to uphold the dignity, deportment and spiritual well-being of the band in every way, Bert Twitchin accepted the commission. A firm believer in the Army's principles and practices, he knew his men would keep in step with him as the band now entered a new era in its already colourful career. A few bandsmen secretly hoped 'the new broom would sweep clean'. They wanted a complete comb-out of those they regarded as second-raters and the band reduced to contesting strength and efficiency. But the new Bandmaster was first and foremost a Salvationist. Zeal for the Kingdom of God mattered with him as much as perfect playing. He looked at the band - now his band - and said to himself: 'These men are good Salvationists. Most of them have given years of service to The Salvation Army and the Kingdom of God. I shall retain every one of them.' So with a friendly, but firm hand holding the bandmaster's baton, and a heart full of goodwill to all, Bert Twitchin began his leadership of the Regent Hall Band which was to last until his retirement, thirty seven years later. He was now setting higher the standard, musical and spiritual, of a band whose fame had spread far beyond London. As Bandmaster he had greater scope for exercising the personal initiative that was an outstanding trait of his many-sided character. Whether speaking or playing, counselling a comrade or administering business affairs, leading a prayer meeting or planning a festival, the Deputy Bandmaster had bounded in original ideas and had promptly put them into effect. Scarcely had the Bandmaster got into his stride when King Edward VII, stricken with a serious illness, died on May 6, 1910. The Bandmaster and the Corps Sergeant-Major mingled with the crowds outside Buckingham Palace to read the bulletins. At that time no civilian bands were allowed to march within the forecourt of Buckingham Palace. However, Bandmaster Twitchin wondered if permission could be obtained for the Regent Hall Band to march past the Palace on Sunday afternoon, playing suitable music. His wishes were made known in certain quarters and the necessary permission was granted. On Sunday afternoon, guided by mounted police, the band marched through crowd-lined streets to the Palace. Hundreds of people watched the great gates of the Palace open to admit the bandsmen into the forecourt, where they played some of the King's favourite hymn tunes. This, the band's first visit to Buckingham Palace, made Salvation Army history and opened a vista of possibilities, many of which the Bandmaster lived to realize. Bandmaster Twitchin was once asked the secret of his success in commanding so large a body of men and maintaining so full a programme of Salvation Army activities. Such questions always gave him an opportunity for paying tribute to the local officers of the band, whose brotherliness, humility and efficiency in their respective offices greatly eased his burden. 'Do you always agree among yourselves?' he was once asked. 'Oh, of course not!' came the forthright reply. Always in step himself, he had the happy knack of getting others to march along with him. His geniality made him almost a genius at bringing the best out of all types of people. His friendly smile would thaw the hardest heart and mellow the resentful and rebellious. His persuasive powers would be brought to bear upon the reluctant to serve, who, encouraged by kindly words, began to believe in themselves and their own powers, and respond to his requests. Opponents found themselves facing a man calm in spirit and confident in his cause; patient under provocation and ready to extend the hand of goodwill long before the first sign of penitence appeared. One Sunday afternoon, some years ago, the new landlord of a public-house near London's Oxford Street was startled by the sound of music. Glancing through a window, he saw a group of Salvationists. Business was brisk and he decided that no religious band was going to interfere with it, so he stormed into the street shouting his protest and a request to the band to be off elsewhere. The Bandmaster greeted the onslaught with a smile and a friendly wave of his hand, and went on conducting. The landlord retreated to turn on his radio at full strength. The Bandmaster continued to smile and the meeting proceeded. The landlord called a policeman. 'Your first Sunday here?' asked the man in blue. The landlord nodded and repeated his request for these religious folk to be moved off elsewhere. The landlord saw the wisdom of those words, surrendered gracefully, and in time became one of the band's best friends in that area. Our fondest memories of our Regent Hall associations include H. W. T.'s infectious loyalty and joviality, earnestness in prayer battles, unashamed joy when sinners repented and saints surrendered, competence and comradeship in Salvation Army banding, unruffled calm and unconquerable faith. His ideals were ever instruments and not mere stipulations. He sustained family and business losses, but never lost anything of spiritual character or confidence; in fact, his faith in God and graciousness of manner never shone more brightly than in the darkness of each trying experience. Few difficulties deterred Bandmaster Twitchin. Tackled with a genial courage, they seemed to call out of him the best of brain and heart. After a season of successful band engagements the Bandmaster suffered an accident. Hurrying to take a telephone call at his office, he slipped, breaking his right knee-cap. Eleven weeks in hospital, away from home, business and Salvation Army activities, was a trying experience to one so active; but it afforded the Bandmaster the opportunity of personal prayer and witness to other patients. To quite a few who were more than interested, he explained the Army's purpose and its varied and far-reaching work. Soon his bed was wheeled to the side of the piano in the ward and at the appropriate opportunity his nimble fingers dispensed soothing music. He also played for the prayer-time services. Calling one day for manuscript paper he began to compose a march. Such an effort in those circumstances demanded discipline of mind and body, but lying on his back and holding the score above his head, he worked out his thoughts. Patients in wheelchairs gathered around his bed to watch him on the job. When he was promoted to the wheelchair stage the writing became much easier, and soon his draft of 'Deliverance' (Band journal 725) was complete. Eleven weeks shut in with suffering gave the Bandmaster a new outlook on life. On his discharge he resolved that hospital visitation would play a larger part in his life as well as in the organized activity of the band, a resolve that was kept over many years. Bandmaster Munn, of Kettering, once asked the help of Bandmaster Twitchin. A young member of the Kettering Band had entered a London hospital. The Kettering Bandmaster and some of the young man's friends visited London as often as time and circumstances permitted. In the meantime, could Bandmaster Twitchin help? asked Bandmaster Munn, suggesting that possibly some of the Regent Hall men could look in. Bandmaster Twitchin not only obtained the services of some of his men, but regularly himself visited the lad. Much as Bandmaster Twitchin revelled in public activities, he was equally pleased to render personal service to needy people. He enrolled himself as a Goodwill member, living up to its motto: 'Such as I have, give I.' A frequent visitor to the Office of the Goodwill Department, he was never known to enter it 'empty-handed'. Sometimes a food parcel would be handed over the office counter with the words: 'I guess you know someone who can make good use of that'. On other occasions he would slip a cheque or treasury note into the hand of an officer, making no conditions regarding its use, except the request that it should do good to someone in need. The same officer was asked to visit an old man living alone in one rather dirty room. Long ago the old man had lost all interest in cleanliness and tidiness. Standing on the dirt-covered mantle piece was a much treasured photograph of Bandmaster Twitchin. 'You know him?' asked the officer. Like most corps in the British Territory, the Regent Hall had to take its share of the hardships of two world wars. With the Bandmaster at the helm, the band was steered through the storms and setbacks of these two great catastrophes. At one time during the 1914-18 war, thirty nine bandsmen were in the forces. The Bandmaster himself received calling-up papers, but the doctor, after one look at his damaged knee, sent him home. In April 1941, while specialing with Mrs. Twitchin at Cardiff, his house was damaged during an air-raid. In the same week his business premises were almost destroyed, with valuable equipment damaged beyond repair. A far greater trial to the Bandmaster than the loss of personal property were the restrictions imposed upon all Salvation Army activities. The struggle for existence in a war-scarred, blacked-out London called for a steadfast patience and continued courage. At one period during the second war the discontinuing of the Sunday night meeting at the Regent Hall was seriously considered. The idea, however, was at once dismissed, and the Regent Hall doors were opened three times each Sunday, the greatly depleted band marching the streets with its Bandmaster striding ahead. In her farewell meeting before leaving London and going into retirement, General Evangeline Booth paid a fine tribute to the devoted service of the Bandmaster by pinning on his uniform the highest honour The Salvation Army can award its soldiers: The Order of the Founder. The citation reads as follows. ‘Bandmaster Herbert W. Twitchin, Regent Hall Corps, London, has rendered exceptional service in Regent Hall Corps for over fifty years as bandsman and Bandmaster; has shown unwavering loyalty to the flag; has faithfully adhered to regulations, and brought the band to a high standard of musical efficiency and personal religion; has set an example of true Salvationism to the world; and was honoured by Their Majesties King George V and Queen Mary in 1932 on the occasion of a visit by Regent Hall Band to Buckingham Palace’. Though young in heart the Bandmaster began to realize that the years inevitably take their toll of physical strength and at his retirement in March, 1947, tributes were paid to his integrity, humility and unremitting sacrificial service from all parts of the Army world. One message from a prisoner in Parkhurst Prison was signed: 'One of your unknown friends'. In the final moments of active leadership he conducted the band in Colonel Coles' selection: 'Stand by the Flag'. The last time the public saw Bandmaster Twitchin on active service, he was leading a Sunday prayer meeting in which five seekers were at the Penitent-form. Released from responsibility, Herbert Twitchin gladly responded to innumerable requests for his presence at festivals and to conduct meetings. Officers and soldiers alike testified to the blessing he brought by his forthright public utterances, and by his gracious manner as he moved among the people-never strangers to him, but always comrade Salvationists. Still marching at the head of the Regent Hall Band (his successor insisted on this), he maintained his love for the lost and the needy, serving them at every opportunity, large or small. To the end of his earthly journey Herbert Twitchin remained in step.